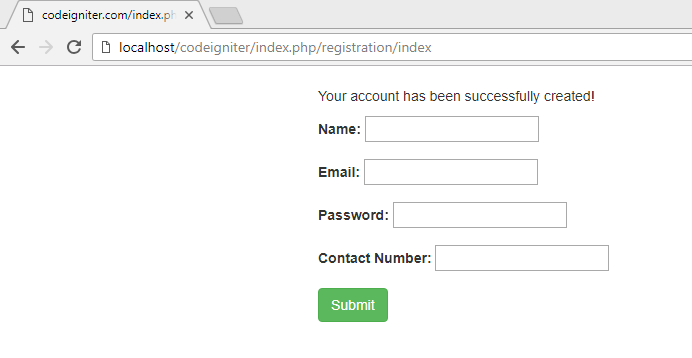 In this section, We'll understand how to create simple registration form in CodeIgniter Framework. To store the customer's account information, a table is required in the database. The following SQL creates a "tbl_customers" table into the MySQL database with some basic required fields. create a table named "tbl_customers". Note: You can also process the form data that is passed to your callback and return it. If your callback returns anything other than a boolean TRUE/FALSE it is assumed that the data is your newly processed form data. note: We are saving the password into database in md5 format. md5() function calculates the MD5 hash of a string and uses the RSA Data Security, Inc. MD5 Message-Digest Algorithm.